In a recent Ask-Me-Anything livestream session, the CEO of Binance, Changpeng Zhao, updated the crypto and investor communities on several developments surrounding the exchange and its projects. Of particular interest, was his answer regarding the launch of the Binance Chain network. During the livestream, he informed that the Binance Chain testnet will become available in the coming weeks. CZ has since confirmed this via tweet by stating the public testing of the testnet will become available on the 20th of February. The tweet making the announcement can be found below. With respect to the number of validators on the Binance Chain, CZ, had this to say during the livestream. I think for the testnet right now we elected to run eleven test nodes. I think any numbers is fine. The number of validators in our network will be small mainly for performance reasons. So it will not be as big as the Bitcoin network with thousands of nodes. It is going to be more like NEO…or even Ripple…smaller number of nodes and each node will be rather large. Also during the Livestream, Changpeng Zhao clarified how the Binance Chain will work without smart contract functionality. In the Binance Chain, there is no smart contracts. We just have an interface for you to issue a token then you can trade it. To not,e is that the ongoing bear market is still in full swing. 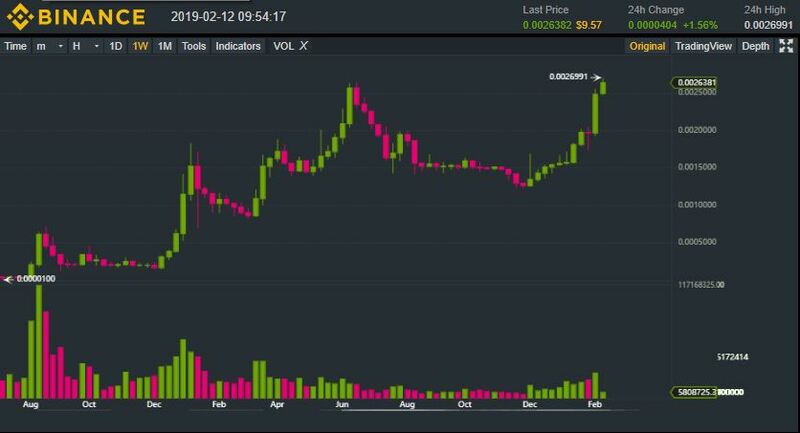 However, Binance Coin (BNB) recently reached a milestone when it achieved a new All-Time-High when paired with Bitcoin. BNB exhibited a new peak at 0.0026991 BTC compared to its last All-time-high of 0.002655 BTC from June, 2018. What are your thoughts on the recent developments at the Binance exchange? Will 2019 be a good year for BNB and Binance? Please share your ideas in the comment section below.